MP3 EmSee is a must have for all music lovers. The tool is unique - it will announce your MP3 songs before they are played on your pc. Listen to your music with utmost convenience! Your audio player plays your tracks, MP3 EmSee announces their titles. MP3 EmSee is easy-to-use. All you have to do is to launch the program, select the tracks to be played and go to your armchair. Get your personal EmSee to announce your somgs for such a humble price. Easily edit the tags of your songs by customizing the album artwork or adding their lyrics to it so that they appear during playback. Snow Player is an audio player that also allows you to access radios. Very complete, you can configure it according to your desires for hours of music. Spotiamp is software that allows you to use the Spotify online music service while having an interface similar to the one offered by Winamp software. Aiseesoft iPhone Ringtone Creator is a handy software that helps you convert all popular videos and audio files to M4R audio format compatible with iPhone, including iPhone 5s/5c. Aiseesoft Transfer iPhone SMS is a powerful Manager for transferring and saving SMS(MMS) and iPhone Contacts. You are able to transfer a special SMS/MMS or all SMS(MMS) and a special Contacts or all Contacts to your PC. 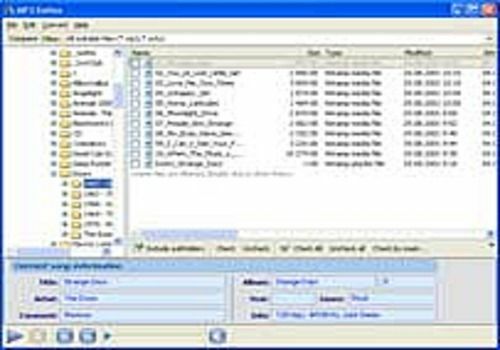 Mp3Tools organizes your music file library Allows you to manage very large libraries Full of small utilities for managing mp3 and other formats.